← Raging at the Post-Modern World: Brave New Jarred Research? InTech Open Access Publisher is thrilled to announce the launching of its new “free for all” and “no-fee”open access journal Nanomaterials and Nanotechnology. The future study of nanotechnology is expected to result in the creation of many new materials and devices with a wide range of unforeseen applications in all fields with perhaps the biggest influence on medical industry. The funding of research in nanotechnology is at the unprecedented level and its impact is expected to be undeniable, since it will affect almost everything over time. The aim of this journal is to publish peer-reviewed papers at the forefront of nanoscale science and technology and make them available to anyone who wishes to leave the manipulation of matter on atomic and molecular scale a less unchartered territory. Besides the fact that the journal will be a free for all open access journal, no publishing fees will be charged. The review process will be made fast with “one at a time” publication model. The Editor-in-Chief of the journal is Dr. Paola Prete from the Institute for Microelectronics and Microsystems, National Research Council in Lecce, Italy. Dr. Prete already acted as the book editor for InTech’s “Nanowires” and she is an active member of the scientific community focused on the advancement of various areas of nanotechnology. Finally, our editorial board is an international one, and one of the board members is the respected C.N.R. Rao, the Linus Pauling Research Professor. Prof. Rao is a member of several academies including the Royal Society and the US National Academy of Sciences, he is the recipient of the Einstein Gold Medal of UNESCO, Hughes Medal of the Royal Society, and the Somiya Award of the International Union of Materials Research Societies (IUMRS). In 2005, he received the Dan David Prize for materials research from Israel and the first India Science Prize. The first 2011 issue of Nanomaterials and Nanotechnology journal is expected in June and the deadline for submission of papers to be included in the first issue is scheduled for 10 May, 2011. The information about scope and topics can be found on our webpage. 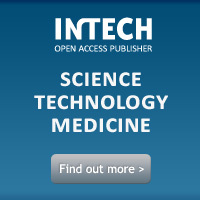 This entry was posted in InTech, Open Access and tagged InTech, intech open access publisher, Nanomaterials and Nanotechnology, nanotechnology, OA, Open Access, open access journal. Bookmark the permalink.